Liverpool are reportedly trying their best to sanction the sale of Lazar Markovic before the conclusion of the winter transfer window. The Serbian has failed to make a single appearance for the Reds under Jurgen Klopp but he has nevertheless remained in the club's ranks with their inability to find a permanent suitor. However, according to The Liverpool Echo, that could change before the end of the current month with the Reds prepared to accept a cut-price deal for the Serbian whose contract expires in the summer. 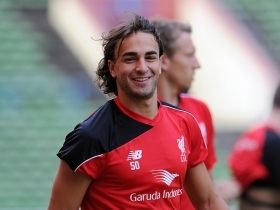 Markovic appeared to hit out at the Reds hierarchy earlier in the campaign after his proposed move to Belgian giants Anderlecht collapsed before the transfer deadline. The Belgian side have yet to retain their interest in Markovic but clubs in the Chinese Super League are prepared to offer him the chance to resurrect his playing career away from Merseyside.